History books are about to get a little longer — a new industrial revolution is here. Industry 4.0 promises to revolutionize manufacturing by digitizing routine processes and empowering plant managers and personnel to make data-driven decisions. Mobile devices are widely seen as the conduit to such smart factories. By their very mobile nature and high computing power, mobile devices can deliver unprecedented efficiencies in manufacturing. Cut your manufacturing costs with one or more of these 10 methods. This will require giving up a piecemeal approach in favor of a complete digitization of all processes to place data front-and-center in manufacturing operations. 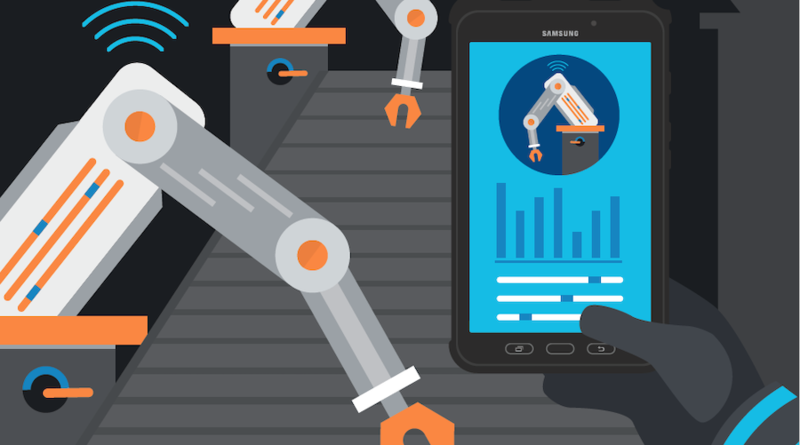 Mobile devices including smartphones and tablets can process data generated at every stage of the manufacturing process to trim waste, improve efficiencies and proactively help plant personnel run operations almost autonomously. Use mobile devices with powerful computing capabilities and plenty of storage to document and store all relevant data from production processes. Eliminating paper means plant personnel save time by not having to record sales orders, inventory reorders or asset maintenance notes by hand. They can instead rely on programs that do much of the dirty work for them. Mobile devices that scan data and enable electronic data interchange also cut down on repetitive data entry and manual errors. Use mobile devices equipped with barcode scanners to manage inventory efficiently. Mobile devices with inventory management software as part of the enterprise resource planning system can ensure that all products are available for a day’s production processes. If inventory runs below a preset level, it’ll save time by automatically connecting with suppliers to order more raw materials. Ordering inventory only as needed frees up cash flow and decreases manufacturing costs. Make vendors and suppliers engaged partners in lean manufacturing processes by implementing electronic data interchange (EDI) software that keeps them in the loop. Allow vendors transparency into your supply chain processes so they can follow along when goods have run low, and be alerted when defective goods need to be replaced or niche supplies ordered at scale. Mobile devices facilitate the transfer of data, which is valuable currency in fostering healthy vendor relationships and reducing materials costs. Use mobile smartwatches to receive alerts about potential equipment malfunctions. Smart factories develop machine learning models that use the Industrial Internet of Things (IIoT) data from embedded machines to predict when a machine is likely to fail. Continuous temperature scans from a motor, for example, can be inputted into the model, so when a predetermined threshold is breached, the system sends an alert to an operator’s smartwatch or other device. Such predictive maintenance increases manufacturing uptime and saves manufacturing costs. Use mobile devices to scan barcodes on manufacturing equipment to receive the latest updates about repairs, schedules for upcoming batch production processes, and a list of personnel qualified to operate the equipment. Plant managers who visit miles of manufacturing floors in one day can use asset management software to get information about whole suites of manufacturing equipment at one glance, which saves time gathering data from other sources. Outfit employees with mobile devices so they don’t waste time having to track and record data from a desktop computer in the corporate office or at a production floor docking station. Whether it’s sales personnel accessing customer invoices on the road or plant managers typing an email to an equipment service provider, such basic functions can (and should) be assigned to mobile devices so employees don’t need to take precious time away from the task at hand. Use mobile devices to record abnormalities in the production process so managers can keep a better watch on quality control. Video recordings and photos can be attached to sales and production order notes to document defects. This helps reduce production interruptions improve production quality. Deploy mobile devices to democratize the availability of data. Authorized plant managers and manufacturing personnel can access information about an entire production process and make data-driven decisions about which aspects of the work need to be fine-tuned. Such transparency also makes it easier for management to detect inefficiencies and thereby reduce manufacturing costs. Mobile devices can coordinate niche production runs driven by customer demands. They have the ability to scale up and scale down to impressive levels of granularity. This allows systems to run autonomously with minimal supervision from plant personnel and meet complex customer needs. A Forrester research report suggests that manufacturing enterprises have significant room for improvement in developing a customer-centric approach to production. This means companies that adopt such a digital reboot today can gain a significant competitive advantage. Learn more about using mobile technology to modernize your factory with our free white paper. Join this free webinar to learn how smartphones or ruggedized tablets deliver more value than traditional scanners.